One of the biggest problems when migrating from Aperture to Lightroom is the albums to collections transition. With the default settings, Aperture Exporter tries to bridge the gap partially by assigning an album identifying keyword to all images in an Aperture album. Note that these keywords are not assigned when the "Create folders for Albums and Smart Albums" option is selected. The second part of that bridge, I see, is solved by Data Explorer written by the prolific Jeffrey Friedl. This Lightroom plug-in has the ability to make collections out of keywords. 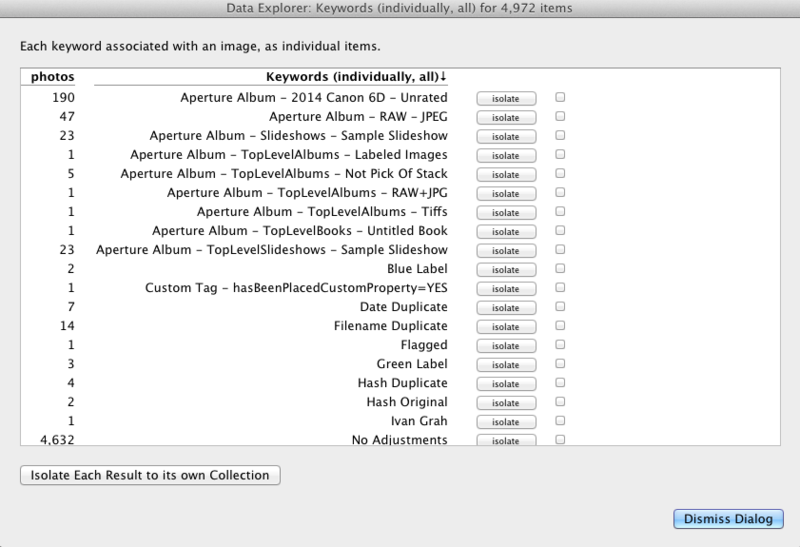 Particularly, the Data Explorer plug-in has a feature where you can explore "Keywords (individually, all)" and from there create collections based on the keywords created by Aperture Exporter. The process is a little less than fully automated, but it is a great aid in converting your Aperture albums to Lightroom collections.